Renowned wood carver Robert Raikes created fabulous hand sculpted bears and dolls throughout the last 30 years. An adorable white plush cat with hand sculpted wooden face and paw pads. I get notifications on my phone and I will get right back to you . This is an original Raikes teddy bear from 1992. #5325 of 7500. Box shows wear with the word "Santa" written on top. Condition: Mint in Box with COA. This item is in used condition and may have flaws or imperfections. Up for sale is this Robert Raikes wood face teddy bear. The bear is 16" tall and wearing a layered aqua colored dress with purple, yellow, and white trim. He is #103/250. From United StatesBrand: RaikesSize: 16in. This is an original Raikes teddy bear from 1992. #3317 of 5000. "Becky Thatcher". Box shows average shelf wear. Condition: Mint in Box with COA. This item is in used condition and may have flaws or imperfections. This is an original Raikes teddy bear from 1992. "Tom Sawyer". Condition: Mint in Box with COA (number on certificate differs from number on foot). #4633/5000 (on COA). #AQQ4737/5000 (on foot). Box shows average shelf wear. Teddy bear Mohair Plush. mohair and jointed. so we may assist in responding to any concerns and or inquiries you may have. Robert Raikes - The Three Bears Collection - includes stand. Baby Bear - LE # 1750/7500 - 8" tall. These Robert Raikes Collection Wee Whittles Jethro & Jasmine Brown Bears come with Certificates of Authenticity. They are in their original box, each in the original navy velvet drawstring bag. The 4.5” bears have jointed heads, arms and legs. This cute pair have bodies of dark brown fur with wood carved faces, paws and a wooden hang tag. Wee Jethro is in a yellow plaid shirt with green plaid overalls. Wee Jasmine is wearing a green calico dress and comes with her own baby doll. Thank you for looking! ROBERT RAIKES COLLECTIBLES. Robert Raikes exclusively for. ROBERT RAIKES COLLECTIBLES. Robert Raikes has carved for years, starting in junior high. Now you're invited into her wonderful handcarved wooden world. Robert Raikes "Angela" 13" Tree Topper Wooden Faced Bear. Very nice piece. Any questions please feel free to ask. Thank you for looking. This is an original Raikes teddy bear from 1995. #2597 of 3000. Condition: Mint in Box with COA. Box shows average shelf wear. This item is in used condition and may have flaws or imperfections. They may have minor problems, be dirty, have odors. I do not know the history as they are second hand. I will go out of my way to make you happy. Up for sale is a Robert Raikes Originals Sidney cat. Cat shows no signs of use or wear. Serial number on foot: AEE2764/7500. Box and bear are in mint condition. Up for sale is this Robert Raikes wood face and feet teddy bear. The bear is 11" tall and wearing a little knit red sweater. In original box with COA paper. He is #083/500. 6265/684 limited Edition of 7,500, black & white. Box has fading. What you see is what what you will receive. New in Box with certificate, box, tags, and has been signed. Box has some rips at the top that have been taped. He is about 22 inches tall. Robert Raikes Brown Jamie Jointed 9" Bear. Applause 1985. It is 581 of 5000. There is a small line on the top of his nose (see photo). From a non-smoking household. Grandchildren were never allowed to play with this bear. ROBERT RAIKES IS SIGNED ON THE FEET. New ListingRobert Raikes Signed Wooden Face Baby Bear in Diaper w High Chair Applause 7"
The Bear has moveable arms and legs and wears a flannel diaper. The bears feet are wooden and the left one is signed Robert Raikes. See pictures for details. Box/papers are not included. This is TIMMY BEAR that was designed by Robert Raikes and was manufactured by Applause Co. in 1988. Model #17009. Robert Raikes is known as a masterful artisan and sculptor. They traditionally have a wooden face and feet and they are individually numbered on their left foot. This is number 2199 of 5000. It is in very good condition. Robert Raikes 8.75" Wood Jointed Doll With Wig and Wardrobe. Complete in the original box as shown. Robert Raikes. The Three Bears. w/ Wood Stand. Tallest Point 12". Bear is jointed. I also have another Robert Raikes Bear listed. ROBERT RAIKES WEE WHITTLES COLLECTIBLE MINIATURE SANTA BEAR IN ORIGINAL RED VELVET BAG. For your consideration is this adorable Raikes Santa bear. Excellent, pre-loved condition with no defects seen. Wonderful Jingle bear by Robert Raikes. This would make a great addition to your collection. Top Rated SellerFrom United StatesBrand: RaikesSize: 13in. Robert Raikes. “DRAGONFLY”. Miniature Teddy Bear. Purple & Silver b ear with beaded flower. Robert Raikes Bear. By Applause. 1995 Limited Edition. However, most international orders do arrive within 3 weeks. Pair of Robert Raikes Originals Rabbits by Applause. Pink Cambria Bunny & Blue Daniel Bunny. This is the wood stand for The 3 Bears by Robert Raikes.You'll receive only the wood stand,not the 3 Bears. 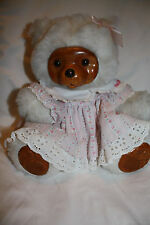 For sale is this Vintage Robert Raikes "Kristy" Bear. It is in good condition. There is a small spot on the back of the right sleeve, I did not try to clean it. It is about 10" high. Thanks for looking. Cupid with bow & arrow and angel wings. Stains on sash and wings - see photos. Robert Raikes Wooden Bear Pilot Lindy 23"
Robert Raikes Wooden Bear Pilot Lindy 23". Condition is Used.